(CNN)U.S. Supreme Court Justice Antonin Scalia, the leading conservative voice on the high court, has died at the age of 79, a government source and a family friend told CNN on Saturday. His death set off an immediate debate about whether President Barack Obama should fill the seat in an election year. Obama said Saturday night that he plans to nominate a replacement, but Senate Majority Leader Mitch McConnell said the nomination should wait until the next president comes into office while top Democrat Harry Reid called for the seat to be filled "right away." Can you say Supreme Court Justice Eric Holder? This may just go down in history as the day the Constitution died. This debate may eclipse the Presidential election activities. I hope it doesn't doesn't diminish the power and importance of the Constitution. May prayers be with his family and the Nation. Fun days ahead guys. This one is a game changer for you. No worries. Our system has a mechanism to deal with this. Ironically, any major attempts by the SCOTUS to alter this mechanism will actually lead to its use. Until the next election at least, the senate can hold off liberal judge appointments by Oldbambam. We might not have a majority in the senate after that. there are only 10 democrats and 25 republicans up for election. If we lose the senate seats it will be just as hard to get a conservative judge placed . Here's a bit of food for thought guys.. It's a great time to review some civics and government. I'm including a text version and one using an infographic. 1) The confirmation process begins when the President selects a nominee for a vacant judgeship. Traditionally, the President selects a nominee in consultation with the Senators who represent the state in which the judge will serve. Senators typically have their own methods of evaluating potential nominees, and can signal their approval or disapproval of a nominee through the blue slip process. 2) The President then refers the nominee to the Senate Judiciary Committee. The Judiciary Committee evaluates the nominee by gathering information, running a background check, and reviewing the record and qualifications of the nominee. 3) The Judiciary Committee holds a hearing on the nominee. Witnesses present testimony on the nominee. Some of the witnesses favor and others oppose the nomination. The nominee also answers questions from the Committee. Senators who oppose a nominee can attempt to delay or derail a nomination by requesting additional information or additional time as a hearing approaches. 4) The Judiciary Committee votes on whether to report the nominee to the full Senate. If the Committee does report the nominee, they can submit the nomination with a favorable recommendation, an unfavorable recommendation, or no recommendation at all. Senators who oppose the nomination can attempt to delay a nomination by using procedural tactics to prevent a committee vote. 5) The full Senate has the opportunity to debate the nomination. The Senate debates until a Senator asks for unanimous consent to end debate and move to a vote on the nominee. If unanimous consent is granted, the Senate votes on the nominee, with a majority vote required for confirmation. Any Senator can refuse to grant unanimous consent. This situation is known as a hold. 6) If any Senator objects to unanimous consent, then a cloture motion must be filed in order to end debate and move to a vote. Cloture motions for judicial and executive nominations require 51 votes to pass. If 51 Senators support cloture, the full Senate will vote on the nomination, with a majority required for confirmation. If fewer than 51 Senators support cloture, debate continues and a confirmation vote cannot occur. This is known as a filibuster. Prior to the November 2013 Senate rules change, all cloture motions required 60 votes to pass. Now, only cloture motions for legislation and nominees to the Supreme Court require 60 votes. 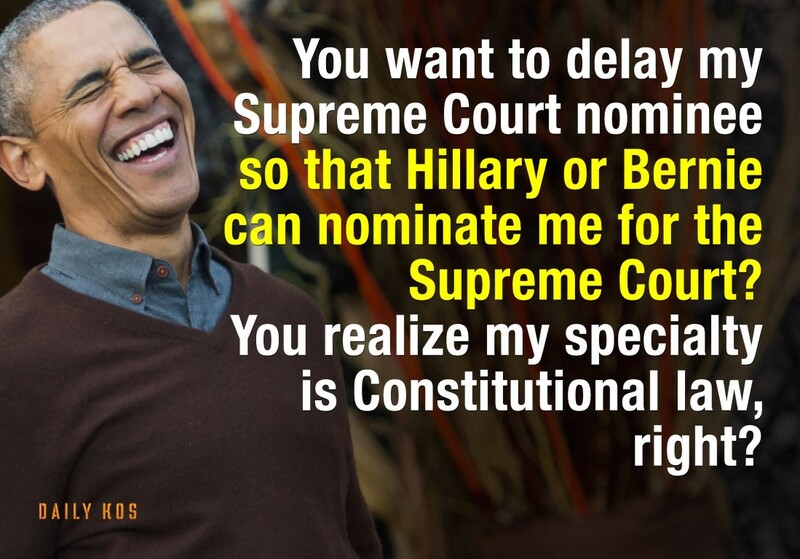 7) Once the Senate holds a confirmation vote, with a majority voting to confirm, the nominee becomes a Federal Judge. Senate controls though who get's appointed. Currently, the U.S Senate is controlled by the Republicans. They have 54 Senate seats, Democrats 44, with 2 independents caucusing as Democrats (effectively giving them 46 seats). In 2016, 34 Senate seats are up for election, 10 held by Democrats, 24 by Republicans. Has anyone heard of a nomination by the president yet? Judge Sri Srinivasan, U.S. Court of Appeals for the District of Columbia Circuit has been floated out there !!! He's been described as someone both sides can get behind but I find that doubtful. "What is the function of the federal government in the USA?" If anything but, "to protect the rights and freedoms of all individuals" comes out of his mouth then he don't make the grade. Sadly, if the budgetary votes of this past year are any indication of the GOPs willingness to stand their ground, they will rubber stamp whomever Obama nominates. There has been a, don't make waves, mentality within the GOP party leadership. If it continues through this process the court will certainly be taking a hard turn to the left.The GOP party leadership has been of a progressive nature for many years. I think they would rather lose the Presidential election than lose their control over the party. The progressive candidates have not faired well in the primaries and now we see their chosen one, Jeb Bush bowing out of the race. If it looks like a conservative or outsider will win the GOP nomination and the Presidency, they may confirm a liberal judge to prevent that President from being so popular that they lose control of the party leadership. If they hold their ground against a liberal nomination from Obama, then they have found a new backbone that I have yet to see. Havent seen one since Winston Churchill. One would be correct. Same goal, but different pockets lined along the path.